Steingraeber it is still managed and operated by the it's namesake, and has changed very little to date. 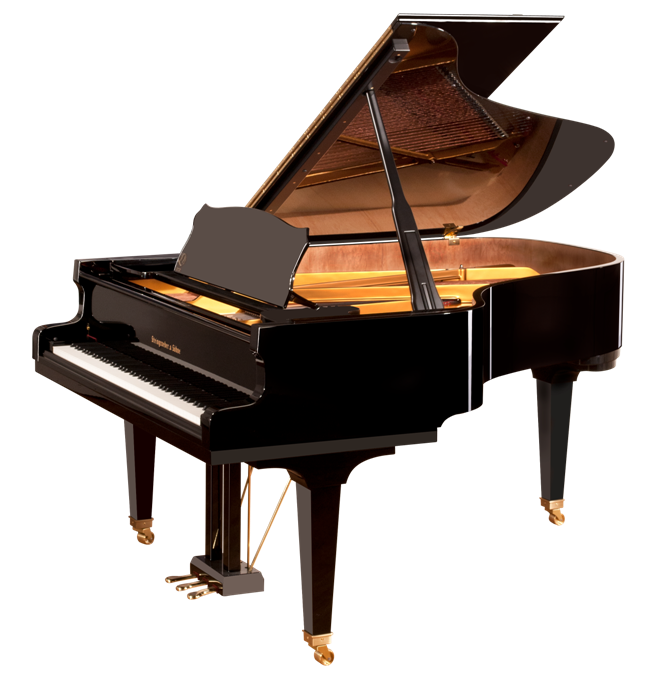 The family is now in its 6th generation of directing the business and they continue to win prizes for the world’s best grand and best upright pianos. Manufacturing only 60 grand pianos by hand per year, in what is arguably the world’s most elite piano factories, Steingraeber uses the most natural materials. The wood is never treated with chemicals. All natural glues and paints are used. No particle board is ever used in the Steingraeber. A unique chain of energy preservers are used including 100% real wood connections, with steel pins, drilled capo d’astro bar, cast hardening , hardened bridge pins, and no elastic glues. This allows the tone to sing for a lifetime. Steingraeber painstakingly selects the spruce used in its soundboards from valleys near Passau in eastern Bavaria. The trees chosen must grow at a minimum of 900 – 1000 meters above sea level, have a minimum diameter of 45 cm and a minimum age of 200 years. 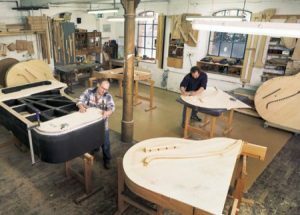 Once the soundboard has been crafted to shape, the thickness has to be adjusted, which varies from 4.5 mm to 9mm. Each soundboard is tested and optimized individually by sprinkling sand over it and then energizing the board to see sand’s response. Wood is then scraped away until the sculpted area vibrates in such a way that sand bounces up and down evenly. The board is then connected to the rim where nothing short of perfection will do. Every hundredth of a millimeter off is a chance for the strings to press the soundboard in the wrong direction. No gap at all is allowed. This piano's playing mechanism is ultimately responsive, feeling substantial without being heavy or sluggish. The down-weight and up-weight are precisely controlled and the keys stay with your fingers to allow you to play to the fullest of your capabilities. There is a uniformity to the touch, and a swiftness to the repetition that is unequaled. This combination of uncompromising materials, brilliant design and perfect workmanship creates dynamic and color range unmatched in any other new piano. 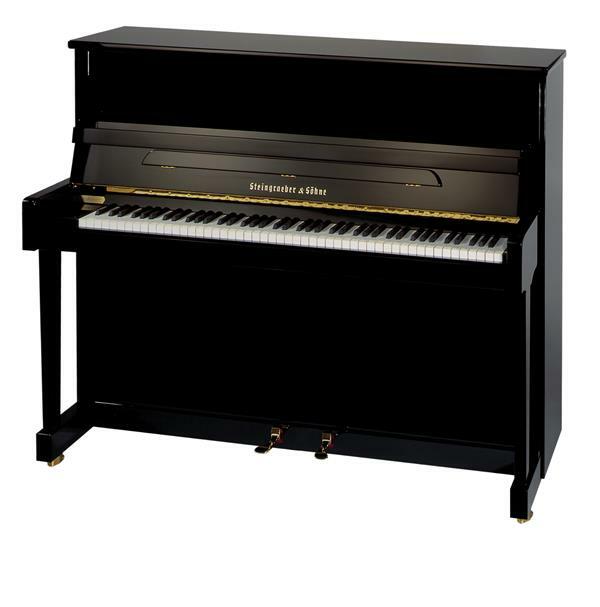 This piano prepared by Hollywood Piano allows the pianist easy access to both dramatic power and delicate subtlety. 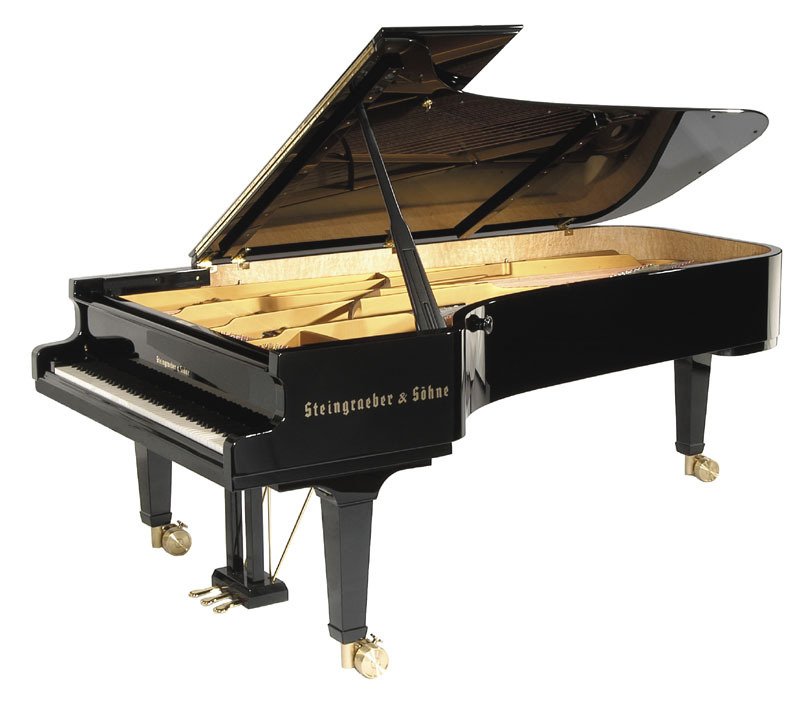 This manufacturer has succeeded in the most difficult of piano manufacturing challenges in creating instruments that are true extensions of the human body. Steingraebers are available in a variety of stunning finishes, from basic black to the most exotic natural woods. The manufacturer will also customize a finish to match whatever you can imagine. 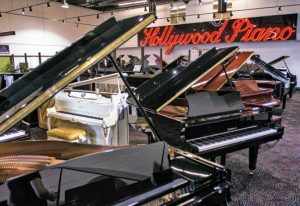 As one of the only authorized piano dealers in Los Angeles, Hollywood Piano has established a reputation for itself as the #1 Los Angeles Piano Store and showroom in the area. Having been a family-owned and operated piano store for decades, Hollywood Piano's showroom has won numerous accolades and awards along the way. Our clients make the drive because we offer what no other Piano Store can - Affordable Prices, a Large Selection and the Highest Rated Customer Service in the industry. Drive a little further for the quality you deserve! 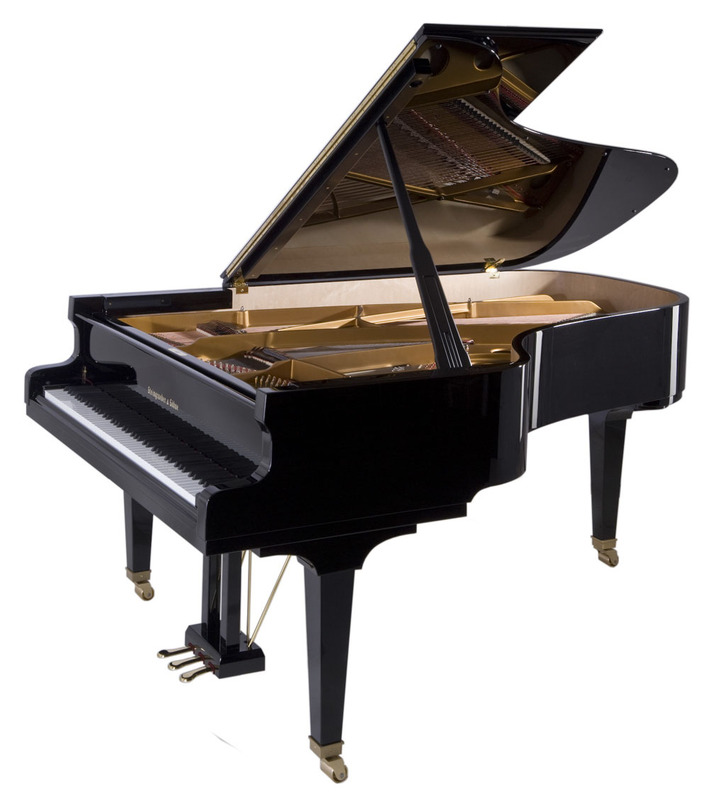 Hollywood Piano is the go-to Los Angeles piano store when it comes to finding the best in grand pianos, tuning, grand piano accessories and related services. 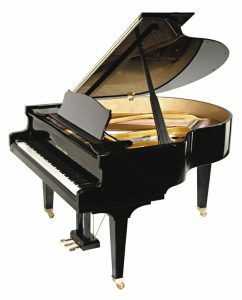 When it comes to buying a new piano in Los Angeles County, fixing an old one or even trying to find a buyer for your used grand piano, there is no better place than Hollywood Piano. Recognizing that all structural components produce sound, Steingraeber 232 uses only the most natural and resonating materials. The wood is never impregnated with chemicals, and only natural glues and paints are used in the case and acoustics area, including the iron frame,. 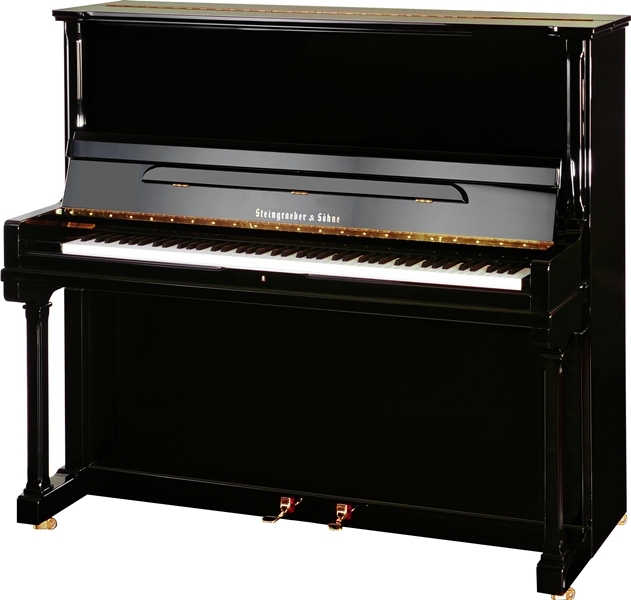 The cabinetry consists only of solid wood – particleboard is never used in a Steingraeber instrument. Steingraeber D-232 painstakingly selects the spruce used in its soundboards from valleys near Passau in eastern Bavaria. Each soundboard is tested and optimized individually and the dynamic range of Steingraeber is unmatched and will play with more thundering power and also with more delicate subtlety than any other instrument. Coupled with Steingraeber’s action, employing Renner parts designed by this manufacturer, the completed product is without peer. This is truly a connoisseurs piano. Musicians choose Hollywood Piano above all Los Angeles piano shops because of our exceptional selection of custom, new and used Steingraeber pianos and our knowledgeable, experienced customer service. 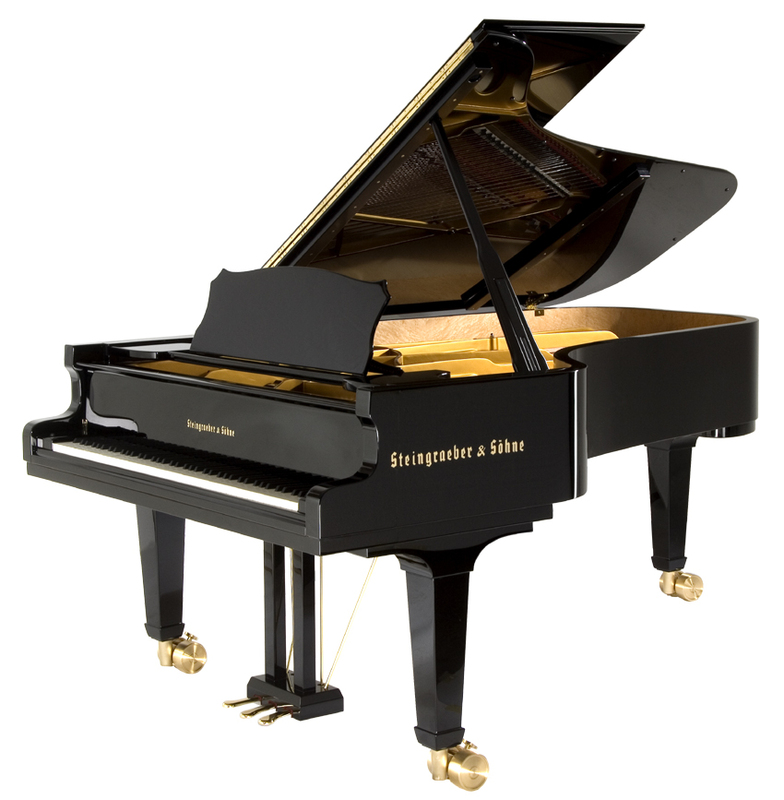 Come into our piano showrooms in Pasadena and Burbank, to see, touch, and play our exquisite pianos for yourself. 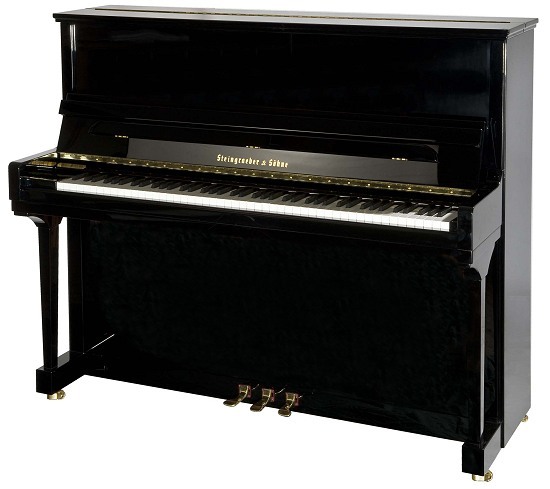 View more of our fine pianos.